Italian opera is both the art of opera in Italy and opera in the Italian language. Opera was born in Italy around the year 1600 and Italian opera has continued to play a dominant role in the history of the form until the present day. Many famous operas in Italian were written by foreign composers, including Handel, Gluck and Mozart. Works by native Italian composers of the 19th and early 20th centuries, such as Rossini, Bellini, Donizetti, Verdi and Puccini, are amongst the most famous operas ever written and today are performed in opera houses across the world. Dafne by Jacopo Peri was the earliest composition considered opera, as understood today. Peri's works, however, did not arise out of a creative vacuum in the area of sung drama. An underlying prerequisite for the creation of opera proper was the practice of monody. Monody is the solo singing/setting of a dramatically conceived melody, designed to express the emotional content of the text it carries, which is accompanied by a relatively simple sequence of chords rather than other polyphonic parts. Italian composers began composing in this style late in the 16th century, and it grew in part from the long-standing practise of performing polyphonic madrigals with one singer accompanied by an instrumental rendition of the other parts, as well as the rising popularity of more popular, more homophonic vocal genres such as the frottola and the villanella. In these latter two genres, the increasing tendency was toward a more homophonic texture, with the top part featuring an elaborate, active melody, and the lower ones (usually these were three-part compositions, as opposed to the four-or-more-part madrigal) a less active supporting structure. From this, it was only a small step to fully-fledged monody. All such works tended to set humanist poetry of a type that attempted to imitate Petrarch and his Trecento followers, another element of the period's tendency toward a desire for restoration of principles it associated with a mixed-up notion of antiquity. Dafne is the earliest known work that, by modern standards, could be considered an opera. The libretto by Ottavio Rinuccini survives complete; the mostly-lost music was completed by Jacopo Peri, but at least two of the six surviving fragments are by Jacopo Corsi. Dafne was first performed during Carnival of 1598 at the Palazzo Corsi. 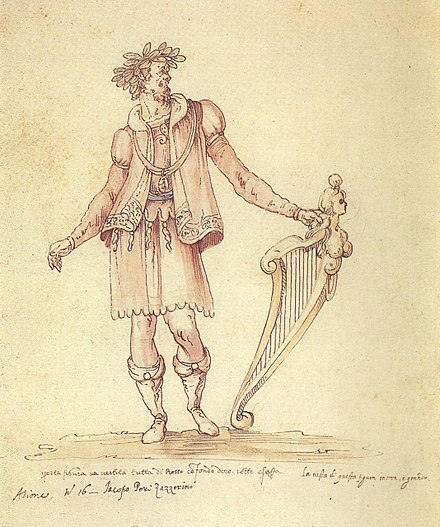 Jacopo Peri, known under the pseudonym Il Zazzerino, I was an Italian composer and singer of the transitional period between the Renaissance and Baroque styles, and is often called the inventor of opera. He wrote the first work to be called an opera today, Dafne, and also the first opera to have survived to the present day, Euridice (1600). In poetry, the term monody has become specialized to refer to a poem in which one person laments another's death. The solo madrigal, frottola, villanella and their kin featured prominently in the intermedio or intermezzo, theatrical spectacles with music that were funded in the last seventy years of the 16th century by the opulent and increasingly secular courts of Italy's city-states. Such spectacles were usually staged to commemorate significant state events: weddings, military victories, and the like, and alternated in performance with the acts of plays. Like the later opera, an intermedio featured the aforementioned solo singing, but also madrigals performed in their typical multi-voice texture, and dancing accompanied by the present instrumentalists. They were lavishly staged, and led the scenography of the second half of the 16th century. The intermedi tended not to tell a story as such, although they occasionally did, but nearly always focused on some particular element of human emotion or experience, expressed through mythological allegory. The intermedio[interˈmɛːdjo], in the Italian Renaissance, was a theatrical performance or spectacle with music and often dance which was performed between the acts of a play to celebrate special occasions in Italian courts. It was one of the important predecessors to opera, and an influence on other forms like the English court masque. Weddings in ruling families and similar state occasions were the usual occasion for the most lavish intermedi, in cities such as Florence and Ferrara. Some of the best documentation of intermedi comes from weddings in the Medici family, in particular the 1589 Medici wedding, which featured what was undoubtedly both the most spectacular set of intermedi, and the best known, thanks to no fewer than 18 contemporary published festival books and sets of prints that were financed by the Grand Duke. The staging in 1600 of Peri's opera Euridice as part of the celebrations for a Medici wedding, the occasions for the most spectacular and internationally famous intermedi of the previous century, was probably a crucial development for the new form, putting it in the mainstream of lavish courtly entertainment. Madrigal comedy is a term for a kind of entertainment music of the late 16th century in Italy, in which groups of related, generally a cappella madrigals were sung consecutively, generally telling a story, and sometimes having a loose dramatic plot. It is an important element in the origins of opera. The term is of 20th-century origin, popularised by Alfred Einstein. Emilio de' Cavalieri, or Emilio dei Cavalieri — the spellings "del" and "Cavaliere" are contemporary typographical errors — was an Italian composer, producer, organist, diplomat, choreographer and dancer at the end of the Renaissance era. His work, along with that of other composers active in Rome, Florence and Venice, was critical in defining the beginning of the musical Baroque era. A member of the Roman School of composers, he was an influential early composer of monody, and wrote what is usually considered to be the first oratorio. In music, an aria is a self-contained piece for one voice, with or without instrumental or orchestral accompaniment, normally part of a larger work. The music of Dafne is now lost. The first opera for which music has survived was performed in 1600 at the wedding of Henry IV of France and Marie de Medici at the Pitti Palace in Florence. The opera, Euridice, with a libretto by Rinuccini, set to music by Peri and Giulio Caccini, recounted the story of Orpheus and Eurydice. The style of singing favored by Peri and Caccini was a heightened form of natural speech, dramatic recitative supported by instrumental string music. Recitative thus preceded the development of arias, though it soon became the custom to include separate songs and instrumental interludes during periods when voices were silent. Both Dafne and Euridice also included choruses commenting on the action at the end of each act in the manner of Greek tragedy. The theme of Orpheus, the demi-god of music, was understandably popular and attracted Claudio Monteverdi (1567–1643) who wrote his first opera, La Favola d'Orfeo (The Fable of Orpheus), in 1607 for the court of Mantua. Monteverdi insisted on a strong relationship between the words and music. When Orfeo was performed in Mantua, an orchestra of 38 instruments, numerous choruses and recitatives were used to make a lively drama. It was a far more ambitious version than those previously performed — more opulent, more varied in recitatives, more exotic in scenery — with stronger musical climaxes which allowed the full scope for the virtuosity of the singers. Opera had revealed its first stage of maturity in the hands of Monteverdi. L'Orfeo also has the distinction of being the earliest surviving opera that is still regularly performed today. Mantua is a city and comune in Lombardy, Italy, and capital of the province of the same name. Within a few decades opera had spread throughout Italy. In Rome, it found an advocate in the prelate and librettist Giulio Rospigliosi (later Pope Clement IX). Rospigliosi's patrons were the Barberini. Among the composers who worked in this period were Luigi Rossi, Michelangelo Rossi, Marco Marazzoli, Virgilio Mazzocchi, Stefano Landi. Since the 1630s, the subject of the works changed greatly: those of the pastoral tradition and Arcadia, it is preferable that the poems of chivalry, usually Ludovico Ariosto and Torquato Tasso, or those taken from hagiography and Christian commedia dell'arte. With the increased number of characters, the Roman operas became very dramatic, and had several twists. With these came along a new method of fixing the lines of the recitative, better suited to the various situations that arose from the rich storyline and that was closer to speech, full of parenthetical at the expense of the paratactic style that had so characterized the first Florentine works. Opera took an important new direction when it reached the republic of Venice. It was here that the first public opera house, the Teatro di San Cassiano, was opened in 1637 by Benedetto Ferrari and Francesco Manelli. Its success moved opera away from aristocratic patronage and into the commercial world. In Venice, musical drama was no longer aimed at an elite of aristocrats and intellectuals and acquired the character of entertainment. Soon many other opera houses had sprung up in the city, performing works for a paying public during the Carnival season. The opera houses employed a very small orchestra to save money. A large part of their budget was spent on attracting the star singers of the day; this was the beginning of the reign of the castrato and the prima donna (leading lady). The chief composer of early Venetian opera was Monteverdi, who had moved to the republic from Mantua in 1613, with later important composers including Pier Francesco Cavalli, Antonio Sartorio, and Giovanni Legrenzi. Monteverdi wrote three works for the public theatres: Il ritorno d'Ulisse in patria (1640), Le nozze d'Enea con Lavinia (1641, now lost) and, most famously, L'incoronazione di Poppea (1642). The subjects of the new operas by Monteverdi and others were generally drawn from Roman history or legends about Troy, in order to celebrate the heroic ideals and noble genealogy of the Venetian state. However they did not lack for love interest or comedy. Most of the operas consisted of three acts, unlike the earlier operas which normally had five. The bulk of the versification was still recitative, however at moments of great dramatic tension there were often arioso passages known as arie cavate. Under Monteverdi's followers, the distinction between the recitative and the aria became more marked and conventionalised. This is evident in the style of the two most successful composers of the next generation: Francesco Cavalli and Antonio Cesti. In Polish–Lithuanian Commonwealth a tradition of operatic production began in Warsaw in 1628, with a performance of Galatea (composer uncertain), the first Italian opera produced outside Italy. Shortly after this performance, the court produced Francesca Caccini's opera La liberazione di Ruggiero dall'isola d’Alcina , which she had written for Prince Władysław Vasa three years earlier when he was in Italy. Another first, this is the earliest surviving opera written by a woman. Gli amori di Aci e Galatea by Santi Orlandi was also performed in 1628. When Władysław was king (as Władysław IV) he oversaw the production of at least ten operas during the late 1630s and 1640s, making Warsaw a center of the art. The composers of these operas are not known: they may have been Poles working under Marco Scacchi in the royal chapel, or they may have been among the Italians imported by Władysław. A dramma per musica (as serious Italian opera was known at the time) entitled Giuditta, based on the Biblical story of Judith, was performed in 1635. The composer was probably Virgilio Puccitelli. Cavalli's operas were performed throughout Italy by touring companies with tremendous success. In fact, his Giasone was the most popular opera of the 17th century, though some critics were appalled at its mixture of tragedy and farce. Cavalli's fame spread throughout Europe. One of his specialties was giving his heroines "ground bass laments". These were mournful arias sung over a descending bass line and they had a great influence on Henry Purcell, whose "When I am laid in earth" from Dido and Aeneas is probably the most celebrated example of the form. Cavalli's reputation caused Cardinal Mazarin to invite him to France in 1660 to compose an opera for King Louis XIV's wedding to Maria Teresa of Spain. Italian opera had already been performed in France in the 1640s to a mixed reception and Cavalli's foreign expedition ended in disaster. French audiences did not respond well to the revival of Xerse (1660) and the specially composed Ercole amante (1662), preferring the ballets that had been inserted between the acts by a Florentine composer, Jean-Baptiste Lully, and Cavalli swore never to compose another opera. Cesti was more fortunate when he was asked to write an opera for the Habsburg court in Vienna in 1668. Il pomo d'oro was so grandiose that the performance had to be spread over two days. It was a tremendous success and marked the beginning of Italian operatic dominance north of the Alps. In the late 17th century, German and English composers tried to establish their own native traditions but by the early 18th century they had given ground to imported Italian opera, which became the international style in the hands of composers such as Handel. Only France resisted (and her operatic tradition had been founded by the Italian Lully). This set the pattern until well into the 19th century: the Italian tradition was the international one and its leading exponents (e.g. Handel, Hasse, Gluck and Mozart) were often not natives of Italy. Composers who wanted to develop their own national forms of opera generally had to fight against Italian opera. Thus, in the early 19th century, both Carl Maria von Weber in Germany and Hector Berlioz in France felt they had to challenge the enormous influence of the Italian Rossini. By the end of the 17th century some critics believed that a new, more elevated form of opera was necessary. Their ideas would give birth to a genre, opera seria (literally "serious opera"), which would become dominant in Italy and much of the rest of Europe until the late 18th century. The influence of this new attitude can be seen in the works of the composers Carlo Francesco Pollarolo and the enormously prolific Alessandro Scarlatti. By far the most successful librettist of the era was Pietro Metastasio and he maintained his prestige well into the 19th century. He belonged to the Arcadian Academy and was firmly in line with its theories. A libretto by Metastasio was often set by twenty or thirty different composers and audiences came to know the words of his dramas by heart. In the 17th century comic operas were produced only occasionally and no stable tradition was established. Only in the early years of the 18th century was the comic genre of opera buffa born in Naples and it began to spread throughout Italy after 1730.
as far as singing was concerned: the complete rejection of vocal virtuosity; a tendency to an incorrect pronunciation of the words; the frequent presence of rhythmic and melodic tics; the use of onomatopoiea and interjections. In the second half of the 18th century comic opera owed its success to the collaboration between the playwright Carlo Goldoni and the composer Baldassare Galuppi. Thanks to Galuppi, comic opera acquired much more dignity than it had during the days of the intermezzo. 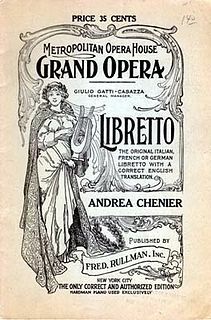 Operas were now divided into two or three acts, creating libretti for works of a substantially greater length, which differed significantly from those of the early 18th century in the complexity of their plots and the psychology of their characters. These now included some serious figures instead of exaggerated caricatures and the operas had plots which focused on the conflict between the social classes as well as including self-referential ideas. Goldoni and Galuppi's most famous work together is probably Il filosofo di campagna (1754). The collaboration between Goldoni and another famous composer Niccolò Piccinni produced another new genre: opera semiseria. This had two buffo characters, two nobles and two "in between" characters. The one-act farsa had a significant influence on the development of comic opera. This was a type of musical drama initially considered as a condensed version of a longer comic opera, but over time it became a genre in its own right. It was characterised by: vocal virtuosity; a more refined use of the orchestra; the great importance given to the production; the presence of misunderstandings and surprises in the course of the drama. The first to really succeed and to leave a permanent imprint upon the history of opera, however, was Gluck. Gluck tried to achieve a "beautiful simplicity". This is illustrated in the first of his "reform" operas, Orfeo ed Euridice , where vocal lines lacking in the virtuosity of (say) Handel's works are supported by simple harmonies and a notably richer-than-usual orchestral presence throughout. Gluck's reforms have had resonance throughout operatic history. Weber, Mozart and Wagner, in particular, were influenced by his ideals. Mozart, in many ways Gluck's successor, combined a superb sense of drama, harmony, melody, and counterpoint to write a series of comedies, notably The Marriage of Figaro , Don Giovanni , and Così fan tutte (in collaboration with Lorenzo Da Ponte) which remain among the most-loved, popular and well-known operas today. But Mozart's contribution to opera seria was more mixed; by his time it was dying away, and in spite of such fine works as Idomeneo and La clemenza di Tito , he would not succeed in bringing the art form back to life again. Romantic opera, which placed emphasis on the imagination and the emotions began to appear in the early 19th century, and because of its arias and music, gave more dimension to the extreme emotions which typified the theater of that era. In addition, it is said that fine music often excused glaring faults in character drawing and plot lines. Gioachino Rossini (1792–1868) initiated the Romantic period. His first success was an "opera buffa" (comic opera), La Cambiale di Matrimonio (1810). His reputation still survives today through his Barber of Seville (1816), and La Cenerentola (1817). But he also wrote serious opera, Tancredi (1813) and Semiramide (1823). Rossini's successors in the Italian bel canto were Vincenzo Bellini (1801–35), Gaetano Donizetti (1797–1848) and Giuseppe Verdi (1813–1901). It was Verdi who transformed the whole nature of operatic writing during the course of his long career. His first great successful opera, Nabucco (1842), caught the public fancy because of the driving vigour of its music and its great choruses. "Va, pensiero", one of the chorus renditions, was interpreted and gave advantageous meaning to the struggle for Italian independence and to unify Italy. After Nabucco, Verdi based his operas on patriotic themes and many of the standard romantic sources: Friedrich Schiller ( Giovanna d'Arco , 1845; I masnadieri , 1847; Luisa Miller , 1849); Lord Byron ( I due Foscari , 1844; Il corsaro , 1848); and Victor Hugo ( Ernani , 1844; Rigoletto , 1851). Verdi was experimenting with musical and dramatic forms, attempting to discover things which only opera could do. In 1887, he created Otello which completely replaced Rossini's opera of the same name, and which is described by critics as the finest of Italian romantic operas with the traditional components: the solo arias, the duets and the choruses fully integrated into the melodic and dramatic flow. Verdi's last opera, Falstaff (1893), broke free of conventional form altogether and finds music which follows quick flowing simple words and because of its respect for the pattern of ordinary speech, it created a threshold for a new operatic era in which speech patterns are paramount. Opera had become a marriage of the arts, a musical drama, full of glorious song, costume, orchestral music and pageantry; sometimes, without the aid of a plausible story. From its conception during the baroque period to the maturity of the romantic period, it was the medium through which tales and myths were revisited, history was retold and imagination was stimulated. The strength of it fell into a more violent era for opera: verismo, with Cavalleria rusticana by Pietro Mascagni and Pagliacci by Ruggero Leoncavallo. Some of the greatest Italian operas of the 20th century were written by Giacomo Puccini (1858–1924). These include Manon Lescaut , La bohème , Tosca , Madama Butterfly , La fanciulla del West , La rondine and Turandot , the last two being left unfinished. In 1926 and in 2002 Franco Alfano and Luciano Berio respectively attempted a completion of Turandot , and in 1994 Lorenzo Ferrero completed the orchestration of the third version of La rondine . Berio himself wrote two operas, Un re in ascolto and Opera. Ferrero likewise has composed several operas including Salvatore Giuliano , La Conquista , and his 2011 Risorgimento! Christoph WillibaldGluck was a composer of Italian and French opera in the early classical period. Born in the Upper Palatinate and raised in Bohemia, both part of the Holy Roman Empire, he gained prominence at the Habsburg court at Vienna. There he brought about the practical reform of opera's dramaturgical practices for which many intellectuals had been campaigning. With a series of radical new works in the 1760s, among them Orfeo ed Euridice and Alceste, he broke the stranglehold that Metastasian opera seria had enjoyed for much of the century. Gluck introduced more drama by using simpler recitative and cutting the usually long da capo aria. His later operas have half the length of a typical baroque opera. Orfeo ed Euridice is an opera composed by Christoph Willibald Gluck, based on the myth of Orpheus and set to a libretto by Ranieri de' Calzabigi. It belongs to the genre of the azione teatrale, meaning an opera on a mythological subject with choruses and dancing. The piece was first performed at the Burgtheater in Vienna on 5 October 1762, in the presence of Empress Maria Theresa. Orfeo ed Euridice is the first of Gluck's "reform" operas, in which he attempted to replace the abstruse plots and overly complex music of opera seria with a "noble simplicity" in both the music and the drama. L'Orfeo, sometimes called La favola d'Orfeo[la ˈfaːvola dorˈfɛːo], is a late Renaissance/early Baroque favola in musica, or opera, by Claudio Monteverdi, with a libretto by Alessandro Striggio. It is based on the Greek legend of Orpheus, and tells the story of his descent to Hades and his fruitless attempt to bring his dead bride Eurydice back to the living world. It was written in 1607 for a court performance during the annual Carnival at Mantua. While Jacopo Peri's Dafne is generally recognised as the first work in the opera genre, and the earliest surviving opera is Peri's Euridice, L'Orfeo is the earliest that is still regularly performed. Euridice is an opera by Jacopo Peri, with additional music by Giulio Caccini. It is the earliest surviving opera, Peri's earlier Dafne being lost. The libretto by Ottavio Rinuccini is based on books X and XI of Ovid's Metamorphoses which recount the story of the legendary musician Orpheus and his wife Euridice. A number opera is an opera consisting of individual pieces of music ('numbers') which can be easily extracted from the larger work. They may be numbered consecutively in the score, and may be interspersed with recitative or spoken dialogue. Opera numbers may be arias, but also ensemble pieces, such as duets, trios, quartets, quintets, sextets or choruses. They may also be ballets and instrumental pieces, such as marches, sinfonias, or intermezzi. The number opera format was standard until the mid-19th century and most opera genres, including opera seria, opera buffa, opéra comique, ballad opera, Singspiel, and grand opera, were constructed in this fashion. Vito Giuseppe Millico, called "Il Moscovita", was an Italian soprano castrato, composer, and music teacher of the 18th century who is best remembered for his performances in the operas of Christoph Willibald Gluck. The term festa teatrale refers to a genre of drama, and of opera in particular. The genre cannot be rigidly defined, and in any case feste teatrali tend to be split into two different sets: feste teatrali divided by acts are operas, while works in this genre performed without division, or merely cut into two parts, are serenatas. A festa teatrale is a dramatic work, performed on stage. Stile rappresentativo is an Italian opera term. It is a style of singing developed in the early Italian operas of the late 16th century that is more expressive than speech, but not as melodious as song. It is a dramatic recitative style of the early Baroque era in which melodies move freely over a foundation of simple chords. Miller, Hugh Milton; Dale Cockrell (1991), History of Western Music. ISBN 978-0-06-467107-1. Parker, Roger (Ed.) (1994), The Oxford Illustrated History of Opera.